Leon E. Larned ,Sr. served as a combat rear gunner on a destroyer during the Korean War, the USS Trathen DD 530. Leon E. Larned, Sr. “Brud”, is shown second row , 6th from the right. U.S. Training Center Recruit Training Command,. Maryland 2nd Regiment Co. 444. 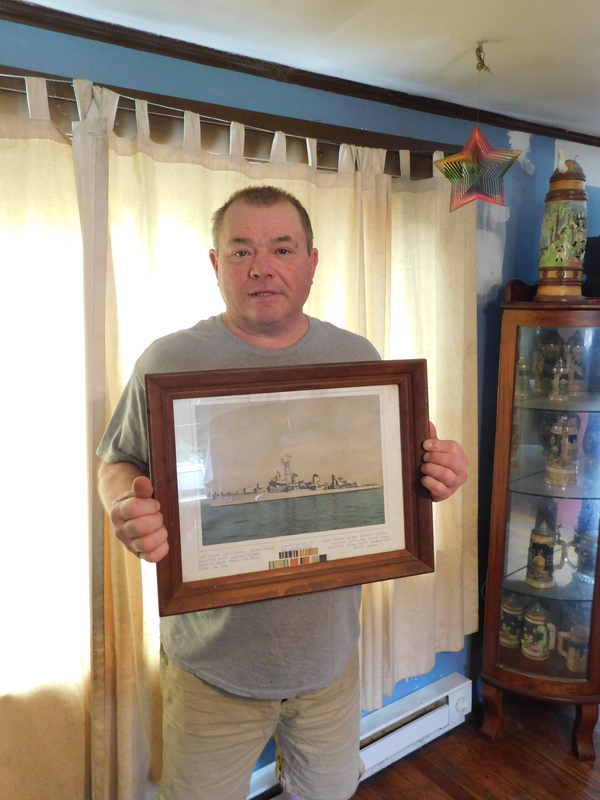 John Larned, Sr. proudly displays a photo of the destroyer on which his father – Leon E. Larned, Sr. – served during the Korean War. 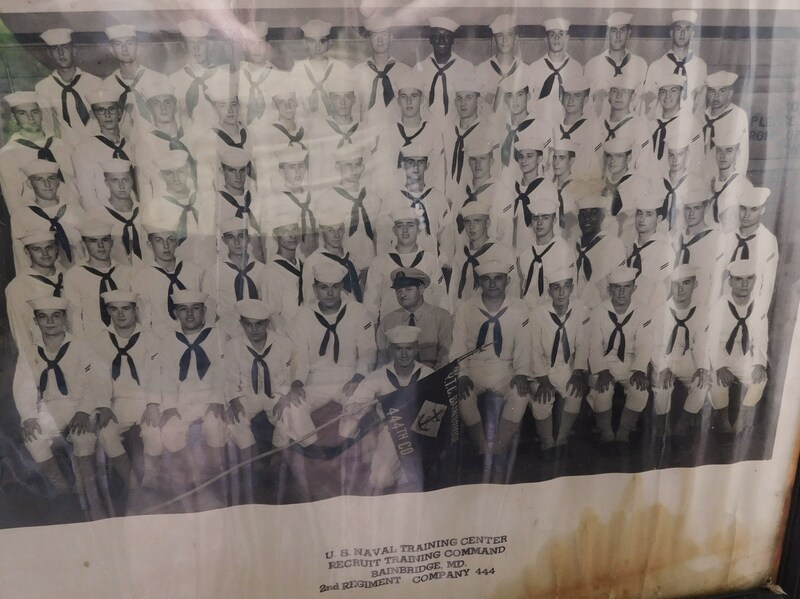 Proudly displayed on his youngest son John Larned Sr.’s fireplace mantle are two framed photos from his father, Leon E. Larned, Sr.’s United States Navy service. 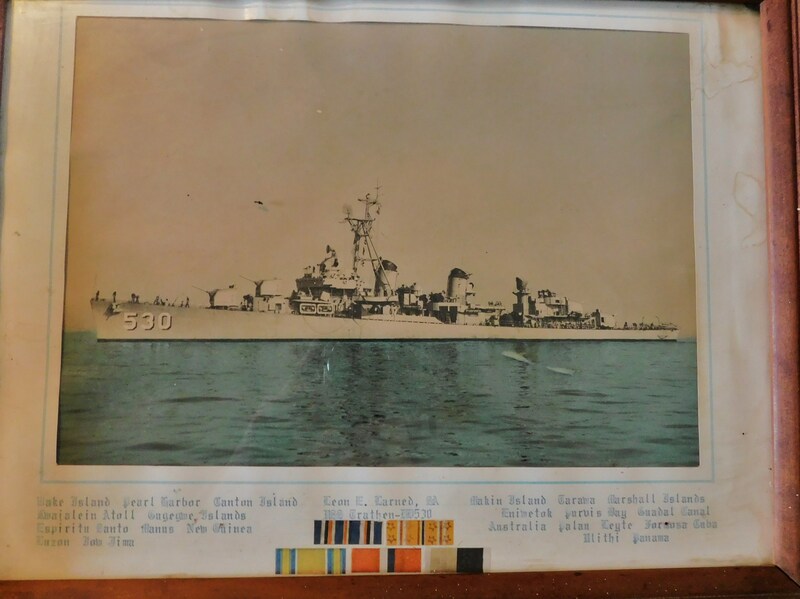 One photo shows the destroyer on which Leon Sr. served as a rear gunner during the Korean War ~ the USS Trathen DD 530. The other photo is Leon Sr.’s recruits class in Maryland, the 2nd Regiment, Co 444. 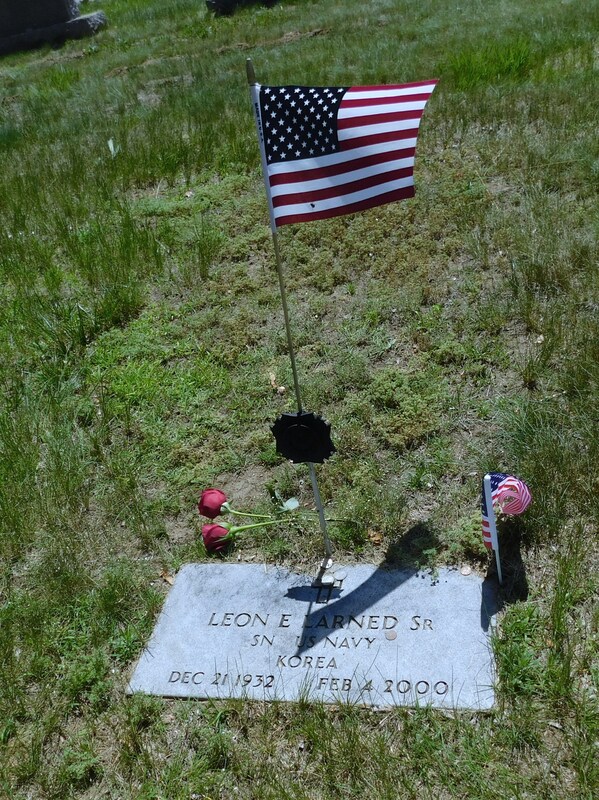 Fortunately for his family, Leon Sr. nickname “Brud”, who saw combat duty, was among those who made it back to parents and siblings waiting at home in Windham, Connecticut ~ where he married and raised a family. Dixie Larned (my sister) was married to Leon E. Larned, Sr. “Brud – shown here with their sons, “Mike” (Leon E.Larned, Jr.) and John Larned, Sr,. Photo by Jacqueline Bennett taken September 30, 2017 in New Haven, CT. The grandchildren ~ Mike’s girls, Michelle and Maryann & John’s children, Johnny Jr. and Ariel. 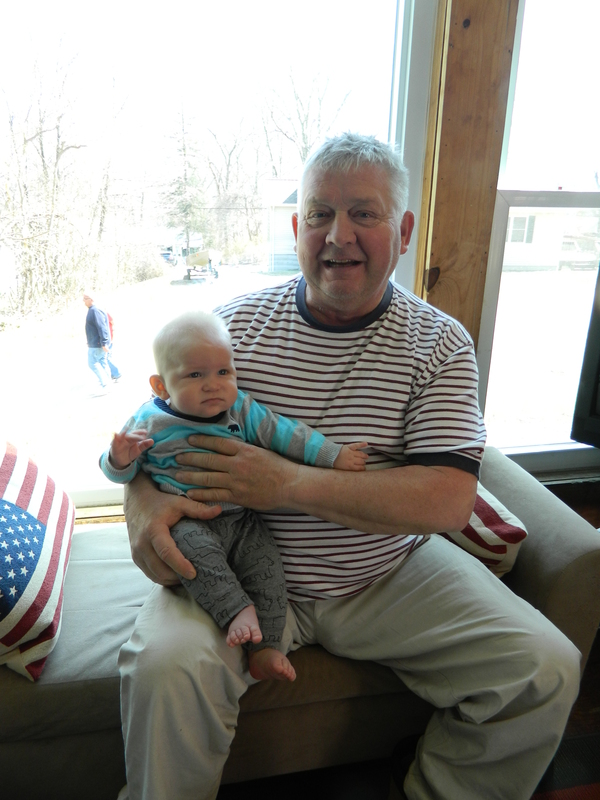 Courtesy photo..
“Mike” with his grandson, Michelle’s son ~ “Brud’s” and Dixie’s great-grandson, Thomas Praskievicz III. Photo by J.B. taken April, 2018. The Korean War began 68 years ago today on June 25, 1950 when North Korean troops invaded South Korea. Soon after, the U.S. came to the aid of the South Koreans resulting in the loss of 36,914 American lives as “the bloody war” raged on. There were 33,652 battle deaths plus 3,262 non-battle deaths that occurred in the war zone, according to the 1994 Pentagon publication “Service Casualties in Major Wars and Conflicts.” Although Korean War hostilities came to a halt on July 27, 1954 ~ nearly seventy years after, the Korean War has not officially been ended in a formal treaty. “The remains of thousands of U.S. soldiers are still in North Korea despite decades of effort by families and the U.S. military to repatriate them,” CNN recently reported. As with so many of America’s World War II and Korean War veterans, Leon Sr. “Brud”, rarely discussed the war, family members noted. Sometimes when meeting at the local American Legion or V.F.W., veterans talked about those days, noted his brother-in-law who served in the U.S. Air Force during the war. But among family, the conversation was mainly about family, he added. Dixie Larned, who was married to “Brud” said he saw the atrocities of war up close, losing one of his best buddies who was blown off the ship while positioned next to him. “He had nightmares,” she recalled. “Brud” joined the US Navy in 1950 at age 18. His two younger brothers, Les Larned and Billy Larned, later also served in the military. 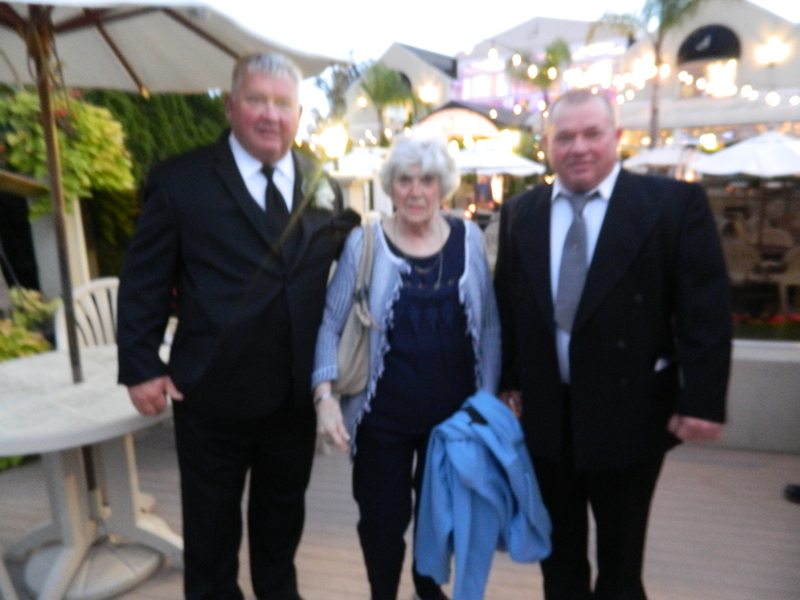 Billy served in the navy on an icebreaker in Alaska and Les served in the army. It was their sister, Shirley, the oldest, who is said to have given “Brud” his nickname, a variation of the word brother – the story goes, repeatedly having asked her parents for a baby brother. Dixie and Brud met in 1953, she attended high school with one of his younger brothers. At the time, “Brud” had another year of navy service left. Subsequently, they married and had two sons, “Mike” (Leon Everett Larned, Jr.) and John. 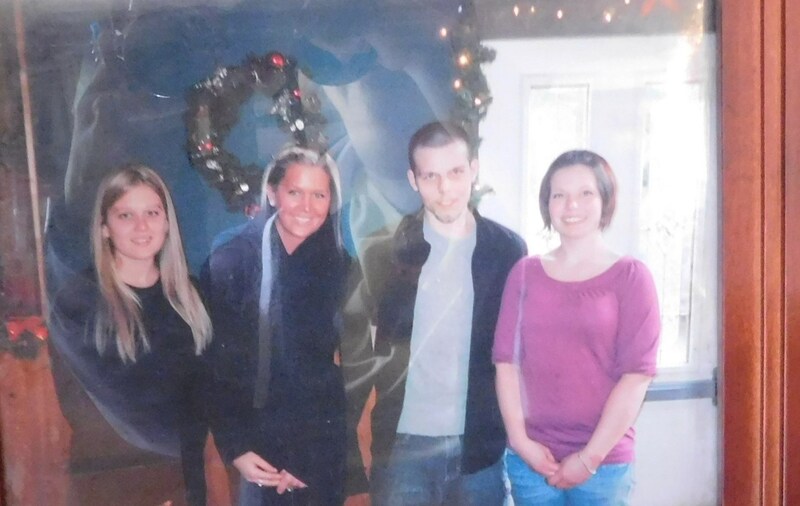 They share four grandchildren: Mike’s girls, Michelle and Maryann; and John’s children, Johnny Jr. and Ariel. As well as, the newest member of the family ~ Michelle’s son, an adored great-grandson, Thomas Praskievicz III. Born December 21, 1932, “Brud” passed away on February, 4 2000. He was buried with military honors in Windham Center. I served on the USS Trathen DD 530 1952-1954 and remember Leon Larned. I’m sorry the USS Trathen Association failed to locate him as we had many memorable reunions over the years. Our last one ws in 2014. The Trathen destroyed an enemy train during our time in Korea, and I have a NY Times article pertaining to that if the family is interested. I also think Leon’s picture is in the cruise book if I remember him correctly.. I can be reached at tincandd530@brighthouse.com.